Highly recommended for conference and gala dinners, balls, nightclubs, as a support for local and touring rock acts; after dinner entertainment, celebrity nights, award dinners, or as a feature show for venues and many other private or corporate functions and events. Based Melbourne, Victoria (VIC) Australia. Louie Lee Feltren previously built his reputation as the singer and front man for Melbourne's biggest party band, Crazy Haus. Now he fronts the band Louie and The Party Boyz performing pop and rock covers for clubs and corporate functions. 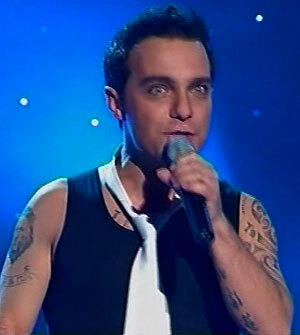 But it wasn't until late 2005 that he won national recognition for his superb impersonation of Mr Entertainment himself Robbie Williams. Performing "Let Me Entertain You" and "Rock DJ" he was hugely popular with the crowd and made it through to the very end. In the grand final he was nationally the most requested competitor for a repeat performance. Returning to the show he sang a fantastic version of "Kids" with Kylie Impersonator Lucy Holmes and has since been requested by Channel 9 to sing with the Channel 9 band. A 45 minute set of Robbie Williams songs with his 4 piece band (guitar, bass, drums, keys) and another set of great general dance songs - 2 hours music. The works! Robbie with the dancers and 10 piece band can offer 2 x 45 minutes of cheeky, strutting, full-on Robbie Williams for a fabulous night's entertainment.